Pak 237/7 in 50 overs Ind 238/1 in 39.3 overs. Get live cricket score IND vs PAK and watch full highlight. It was the 3rd match of Asia Cup 2018 super four, being played in Dubai International Cricket Stadium Dubai on 23 Sep 2018 from 4:30pm IST. 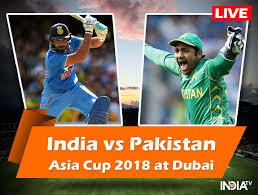 I am sure that this match will be a high voltage battle between the cricket teams of two countries India and Pakistan. Hi, friends I am Gyan Ranjan. In this blog post, You can watch live cricket score. Also, you can watch the full highlight just after the match. Shoaib Malik played a great inning of 78 runs. Sarfaraz Ahmad 44, Fakhar Zaman 31 and Asif Ali scored 30 but other players couldn't do well for the team. Pakistan scored 237/7 in 50 overs. Jaspreet Bumrah, Yajuvendra Chahal and Kuldeep Yadav got the 2-2 wickets in this IND vs PAK the 3rd match of Super Four of Asia Cup 2018. Babar Azam got run-out due to best throw, a combination of Ravindra Jadeja and Yajuvendra Chahal. India's opener batsmen Rohit Sharma and Shikhar Dhawan again played an amazing and great inning for India and did record highest partnership for first against Pakistan. Both players got Century. Rohit Sharma also completed 7000 runs in ODI. Shikhar Dhawan scored 114 runs. Any bowlers of Pakistan couldn't get any wicket. Shikhar Dhawan lost his wicket as run out. Rohit Sharma scored 111 runs and remained not out. India scored 238/1 in 39.3 overs and won this match by 9 wickets.